With every EMV & Contactless project the most important part is to assess the impact and compliance of the organization. There are many aspects that need to be reviewed and these tasks can take considerable time. Critical items are sometimes missed if done internally and independently within the organization. 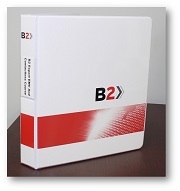 B2 has designed a unique process to make this first step as easy and as efficient as possible. We have found that a consolidated knowledge transfer followed by a detailed assessment with all stakeholders is the best way to jump-start the project and assess the impact of EMV & Contactless in any given environment. If you are a Payment Network, Card Issuer, Acquirer, Processor, Card Vendor, POS Terminal Vendor, Personalization Bureau or Merchant we have a workshop that has been designed just for you. Within a very short period of time we are able to identify scope, gaps and open issues that can be immediately worked on by the customer followed by detailed documentation describing all issues covered during the workshop. Step 2: A comprehensive workshop used to identify scope, gaps and open issues.